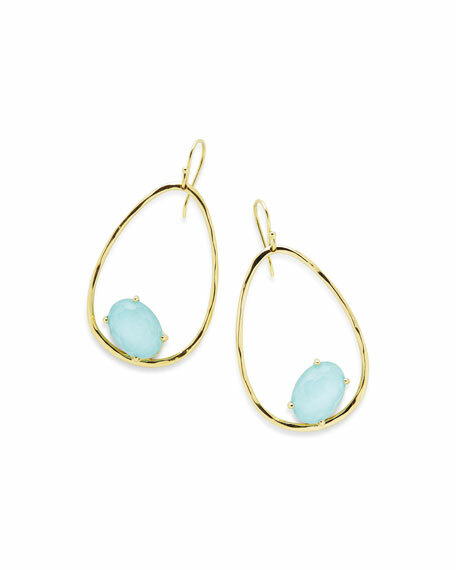 Ippolita earrings from the 18K Rock Candy® Collection. Open pear-shaped drop with tipped, illusion-set oval clear quartz and turquoise doublet. Devon Leigh statement earrings. 18-karat yellow gold plating. Faceted round turquoise in rope bezel setting. Tear-shaped chain link drop. 14-karat yellow gold fill ear wires. Approx. 4.5"L x 2.8"W. Made in the USA. Please note: As this piece is handmade, exact stones and measurements may vary slightly. Turquoise and quartz earrings by Dina Mackney. 18-karat yellow gold vermeil over hardware. Oval-cut turquoise cabochon bezel as post. Emerald-cut Brazilian quartz bezel as drop. Post backs for pierced ears. Approx. 1"L x 0.5"W.
Olivia huggie drop earrings by gorjana. 18-karat yellow gold plated brass. Huggie hoops with pear dangles. rose quartz or turquoise stones. Lever backs for pierced ears. Imported. Delicately hammered huggie earrings are completed with a genuine gemstone charm.